*insert squeal* I MET LIONEL RICHIE! What happened Meik? How did it happen? WHY it happen?? First IF LI-NEL comes to your city.. GOOOOOOO see his show.. it's like a freaking mega karaoke session since everybody knows all of his songs. Trust me on this. You won't regret going--er.. well you might if you aren't a fan of shawt armed Cee-lo, but just get there after his set mmk? Now onto Friday night.. like any person that gets tired of going out, I have become a homebody and best friends with Netflix and my On-Demand channels and I can't forget thousands of my twitter friends. So with my AKA sorority sisters in town for Boule, I decided it's time to be social because it's not like they live here and I can see them any ole time right? We meet up for drinks and our party dwindles down to two and frankly I have had enough of latin jazz night at Blue, so I suggest that we head over to the Ritz Carlton to see if they have live music and mingling going on. Mind you, I'm 3 ..or was it 4 martinis in, and feeling nice. I'm also pretty sure I shouldn't be mixing alcohol with the mofo'n medicine I am on for my leg, but that's another story for another day. So we end up sitting next to the bathrooms and near the lobby, because the place is packed. It's dark, there are black folks everywhere but the music is niiiiiice. 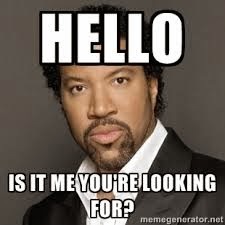 So I'm twerking in my seat and I look up and see a light skinned man that resembles nobody other than Lionel Richie. Nawl.. nawl.. nawl.. that can't be him. My mind's playing tricks on me. Besides, his concert was in Charlotte on Thursday and surely he would have already left town by now. IT CANNOT BE HIM. He is getting closer, and I'm squinting trying to get my dry arse contacts to focus. He gets a little closer and there's a white dude with him that I assume is either in the band, his manager, or well he was too small to be anybody's bodyguard, but hey, you never know I guess. Ebony and Ivory are right by us and I say ..OMG..THAT IS LIONEL RICHIE!! Anyhoo back to the story.. my soror and two other ladies sitting there look at me as if I have lost the absolute last bit of sense I was born with. Okay, so maybe I have, but that ain't the point! THAT IS LIONEL RICHIE! I jump up---well the best I can with my leg, and say THAT WAS LIONEL RICHIE THAT JUST WENT INTO THE BATHROOM!!! I high tail it over to the entrance to the bathrooms and post up on the wall. My soror signals that if it's him to let her know and she is ready to take a pic. A little indian girl slides over beside me and I'm like "did you see what I saw?" She nods and whispers Lionel. YAAASSS I'm not crazy!! But wait.. not one person in the Ritz bar area paid him a bit of attention. Maybe they thought oh, that's just another light skinnTed Charlotte negroid trying to look like someone important, or they thought who the hell is that cat daddy and why is he wearing them tight arse pants? Either way..nobody else has spotted him. TMZ ain't got ish on me I tell you. Maybe I can get a job there since nobody else will hire ya girl. Anyhoo..the door opens..some dude walks out. ugh YOU ain't Lionel. Door opens again.. another random walks out. YOU ain't Lionel either. FINALLY..door opens again and Lionel walks out..I nod frantically at my soror who is quick on her feet and manages to get over there within 2 seconds. "Mr. Richie, Lionel, heyyyy can we get a picture?" He grabs me and lil indian girl and we are in the same pic and I tell him thru my smile that I work for SoulTrain.com and he turns to me and says "No Kidding?! That's great!" *faints* Li-Nel is ahhhhh-maaazing. Now for 65 years old, Li-Nel ain't got no wrinkles nowhere..tho I guess if I had his bank account, I would be looking like a Commodore until I was 100 years old. He's also not the 6'2 man I thought he'd be in my head, he's probably more like 5'9 but who cares.. When I tell you it did not matter to me one bit that he just came out of that bathroom and I didn't know or care if he washed his hands. Hell as far as I was concerned, I could have Li-Nel pee on my shirt and I would still be in 7th heaven. Judge me if you want to. I gather my thoughts quickly and say Mr. Richie will you take one more pic for me..and he turns and says sure realllly quick. Snap.. pic taken.. I tell him thank you and that his concert was absolutely the best ever and amazing. He turns to me, and with the grace and humbleness of someone just starting in the biz, rather than a man of his stature and legendary everythang, grabs my hand and says thank you so much, I appreciate it really I do. OMG OMG OMG HE LOVES MEEEEEE!! no wait..that's Idris Elba that loves me. Then someone else stepped in his way and he said, "by the way, what's going on in here tonight?" Someone said, "it's just a regular Friday night in Charlotte".. I'm thinking, THE HELL YOU SAY.. LI0NEL RICHIE IS HERE!! THIS AIN'T REGULAR! All I know is this, Lionel didn't have to entertain us with even one pic or conversation, but he was super nice and friendly. I understood his reason for saying take the pics quickly, because he didn't want other folks to catch on that he was there and then they'd start wanting pics and autographs. Just as fast as he was there.. he was gone. I swear he vanished into thin air like Michael Jackson did in Remember the Time. I'm telling you, I never saw him walk out the door or get on the elevator. WHERE DID LIONEL GO?!!! Thin air. He probably paid for a thin air vanisher with all that money he has. Hell, if I was him, I wouldn't even be on tour, I'd be walking to my mailbox daily to get my checks and chillin by a pool or something. Lesson Learned: Keep your mofo'n eyes peeled.. you never know who you might see. You gotta move fast to get what you want. Next step.. calling his peeps to hopefully set up an interview *crosses fingers* .. I haven't calmed down from this not one bit..I feel like "Dancing on The Ceiling" "All Night Long!!" What's your favorite Lionel Richie song? This one is in my head right now so I thought I'd share..come on 2 step with me! I can totally feel the fervor in your fingers as you typed up this account if your chance meeting with Lionel Richie--good stuff! And good luck getting the intvw! Girl what????? Did he smell as good as he looks? I am so JELLIS! You are right, you never know who you are gonna see. I saw F Murray Abraham (Scarface, Homeland, ect) and ain't even know who he was til he was gone lmao.